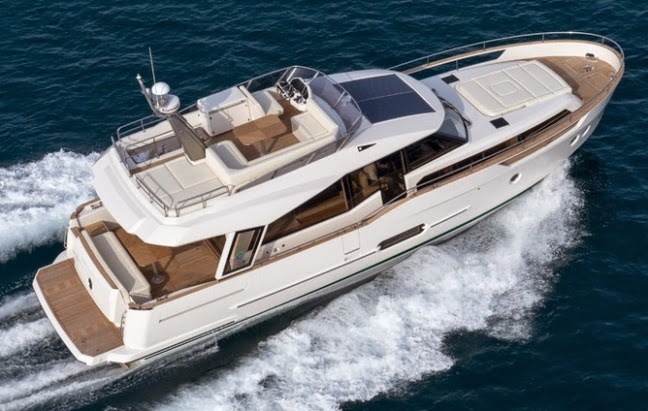 Presented during the first month of the year Dusseldorf boat show, the new Greenline 48 Hybrid is an interesting and innovative hybrid explorer motor flybridge cruiser. The 48 Hybrid largest of the Greenline family raises the game in the offer from this builder not only in size but also the quality of the vessel. Since the launch of the 33 model Greenline has generated a lot of buzz in the industry. Apart in its innovative propulsion solutions the 48 Hybrid strikes for its three double cabin layout, astern galley, and a small ship like main deck. Other interesting details are the optional choices; three for the main deck, and two below. The option on the main deck regards the starboard side behind the helm; this available with entertainment unit, or sofa, and or two chairs. Below is option for two scissor type double to fore instead of a fixed double queen sized berth, and a crew cabin to aft with shower head to aft. Power options are four diesel engines starting at 110hp this giving eleven knots max, up to twin 380 which adds top speed by twelve nautical miles per hour. Greenline 48 Hybrid also features twin fourteen kilowatt propulsion which give a max speed of six knots a cruise of four and an autonomy of 20 nautical miles.